When Can Debt Be Good? Most people think debt is a bad word, and we should try our hardest to avoid it. I tend to agree, and try my hardest to avoid it. I presume I gained this perspective at a young age from my dad, who always told me to avoid debt when you can. But is this logic the best approach to being the most efficient with our money? We need to understand how debt can be good if used responsibly. After reading this post, you will understand how debt can be used to help grow your net worth and when you should avoid it. Education. Gaining skills is critical to one's future success in today’s society. Unless your name is Bill Gates or Mark Zuckerberg, you will likely need to educate yourself at a university or college to earn more income. For example, let's say you take out a 10-year loan for $50,000 at an 8% interest rate. By using an amortization calculator (which you can access here), your total payments will equal $72,797 which works out to 120 monthly payments of $607. After you graduate college, you are able to secure a job producing an income of $50,000 which amounts to $4,167 per month. In summary, by acquiring debt of $50,000 or $607 per month you are able to generate a monthly income of $4,167. This is a fantastic return on your investment and shows how debt can be used as a tool to increase your net worth. Investing. In the world of investing instead of taking on a loan, you use what is called margin. Buying on margin is how investors borrow money to purchase stocks, bonds, and other financial securities. The logic is this; if you can borrow on margin at 2% interest and earn a 5% return on your investment, then you earn 3%, or what investors call the “making the spread”. Napkin Note: Commercial banks like Citibank, Chase, and Bank of America earn the spread between depositors and borrowers. In return for your deposits, the bank pays you interest and uses your deposit to provide loans for other consumers for home, auto and credit card loans. These loans earn a higher interest rate than the rate the bank pays you for holding your deposits. Residential Real Estate. Buying a home is likely the most significant purchase and hopefully one of the best investments you will make in your life. Again we utilize debt to leverage our current financial position. By placing as little as 10% down on certain real estate properties, you will own an asset which is worth 10 times more than your initial investment. Let’s say you purchase a home for $200,000 but put down a 10% down payment, which is $20,000. After one year the home's value appreciates to $225,000 or 12.5%, and you decide to sell. Once you have paid off your loan, you will have earned $25,000 or a massive 125% return, which isn’t bad to say the least (not including closing fees and taxes). Now instead of purchasing a home you invest the $20,000 in Apple stock, and after one year the price of Apple's stock also appreciated by 12.5%, but here you only earned $2,500. Thus utilizing leverage to your advantage can prove extremely valuable. So by now, you may begin to see a trend. In each of the three scenarios above, we leverage our current financial position (by taking on debt) to generate future cash flows, with the hopes of ultimately increasing our net worth. 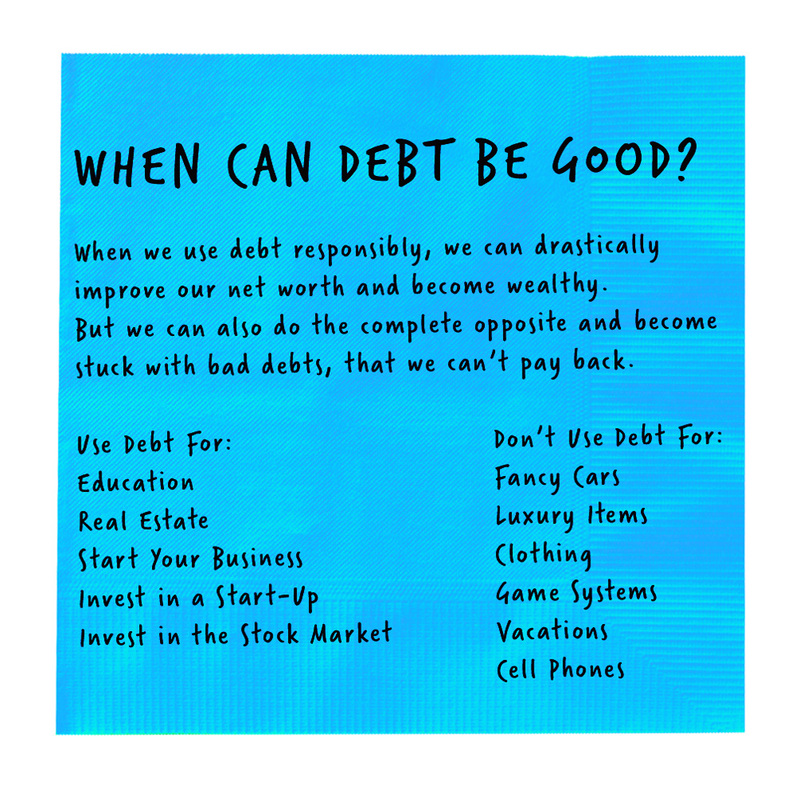 Below are a few additional ways where debt can be good. Not a Sure Thing. One of Mike Tyson’s most famous quotes is “Everybody has a plan until they get punched in the mouth.” Just because you receive a good education doesn’t mean you’ll get a job right after you graduate college. You may have to accept a lower paying job to start. Not every investment you make will work out and what happened to those people who bought homes just before the Great Recession in 2008 and lost everything. Of course, we all plan on being successful, but we must be aware that things happen and we need to adapt to changes to grow. They’re no guarantees in life, so we must be smart and assess how much risk we are willing to take in return for the potential rewards. This is simple; bad debt is anything that will not increase your net worth. Understand this; if you take on debt that does not increase your wealth you are only taking the future money you earn to pay principal and interest on assets that fail to provide any future monetary value. *Excludes rare antiques and collectible items. Interest rates on your credit cards are incredibly high. For example, let's say I purchase a fancy TV for $1,500, and I choose to buy the TV with my credit card. I decide I can afford to pay $50 per month until the loan is paid off. My credit card currently charges me interest at a rate of 17.49% APR (Annual Percentage Rate). Using the debt repayment calculator from Credit Karma (which you can access here), it will take me 40 months or an additional $487 to pay off this loan. Your TV which initially cost you $1,500, now became almost $2,000, plus you will need to spend $50 less for 40 months to pay for this TV. And if that wasn't enough after you are finished paying this TV off, it will be almost three and a half years old and outdated. The items listed above are items you should save for and pay off immediately. Should you charge them to your credit card, make sure you pay them off at the end of each month. Credit card debt can creep up on you, and before you know it, you’ll be paying 25% more for all the items you purchase because of the high-interest rates on credit cards. The bottom line is don’t choose debt if you’re expected net worth will decrease as a result.